After being in Leadville for 10 consecutive days, I had to go back to Longmont today. But I had time for a morning run. Go big, THEN go home! That was my motto. The choice was obvious: Massive. I hadn’t been up the east slope before so that looked like good fun for the day. 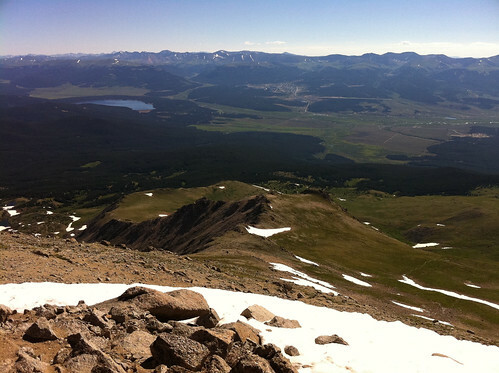 My 2nd ever visit to the top of the 2nd highest peak in Colorado! 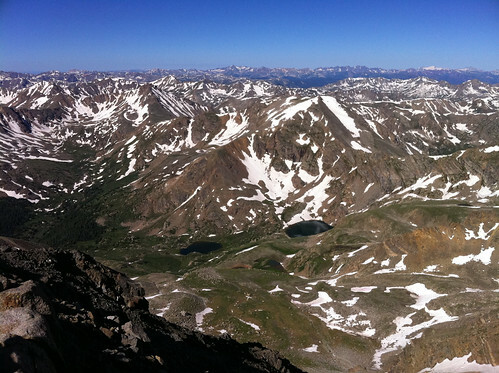 Mount Massive is the closest 14er to our house. It looms over top of us. I can reach its wilderness area in about 4 miles of running but that isn’t where the trailhead is. So I left the house and drove over to Halfmoon Road to the trailhead. I debated just running to the trailhead but that would have been a few extra miles than I had time for today. Arrived to find the main trailhead and overflow parking lots totally full. Cars were jammed everywhere on the road. Found a ditch to put my H2 in and suited up. Some older dude came running at me from Halfmoon Road north. He stopped to talk. He was about 70+ and had Lunaracers on. He was heading the same way I was going. Apparently, he is some age group winner at Pikes and will be back this August. Missed his name. We chatted about the LT100. He *assumed* I was running it. Good bet but funny that he was in the know and that I looked the part I guess. Hit the watch and took off up the Colorado Trail. Had about 3 miles to go before the left turn up the main Massive trail. It was good moving through this section once my heart settled down from the initial little climb out of the valley. I was blowing by packs of hikers just getting started on their day. I still get a thrill out of running by folks like that. Its no reflection on them, its just kind of fun. Crossed the creek at mile 3 and quickly saw my left. Took it and then the grade increased. Had about 3 miles to go and I was only at 11,000 feet. That means we gotta cover 3,400+ feet in 3+ miles. Damn. Paced slowed but I kept moving on. Popped up above treeline and could see Massive laid out in front of me. Long way to go up there. Stayed on the run up until mid mile 5. Then alternated. Mile 6 was nearly all hiking as I was fatigued and burnt from the initial miles. Still moving past groups of folks. Busy trail today. 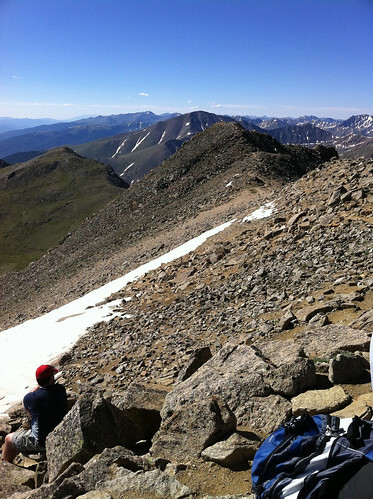 Finally reached the ridge and I was at 14,000 feet. 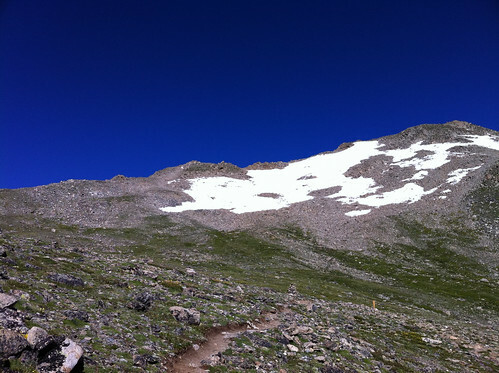 About 1/2 mile of running at 14,000 feet now to go gain the true summit. 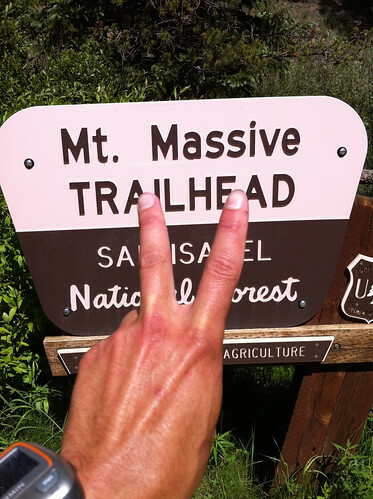 Massive has 5 summits over 14,000 feet. 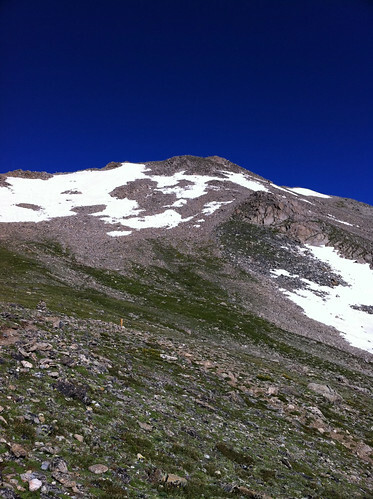 The running up there is the best because its fun yet safe ledges and rock scrambles. I looked down at my watch and I was up in the 1:5X range. Gotta hit 2 hours now. 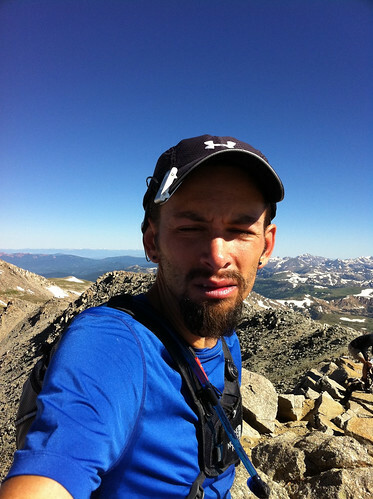 So I ran even harder and tagged the summit at 2:00:35. Good enough. I about fell over and everyone else on the summit thought I had been giving that effort level since the bottom I figured. Best photo I took of me. Bummer. I swore I would never return to a 14er summit once tagged the first time. That mentality changed a few years ago as I have repeated many of them due to proximity, friends, and familiarity. 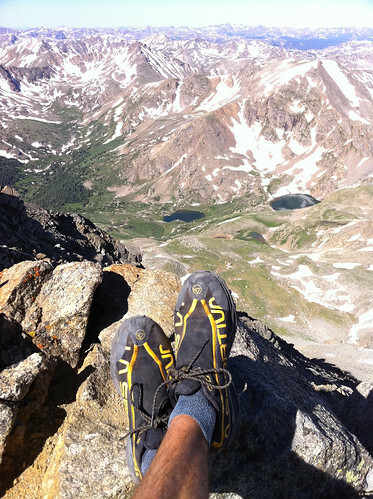 This was indeed a nice summit because the first trip up Massive, while awesome, was epically challenging back then as the day drug on. 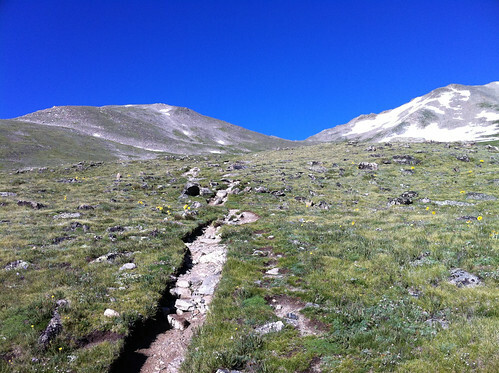 A guy started up a conversation with me by asking, “Are you training for the Leadville 100?”. Finally was able to say “YES!” to that last year but this year was more like “yes”. He went on to talk about Born to Run and such. Fun chat. Finally he was telling his friend that LT100 is like the hardest event in the world. I corrected him but did indicate it ain’t easy either! Time to head down that way! But quick check…yep, there is my house…at least the trees I live in. Got moving pretty good on the decent and did the usual passing of all the hikes I had seen in the prior 2 hours of ascending. Always another fun aspect to hear the phrases muttered. “Rock Star!”, then “I hate you”, then “Amazing”, then “You are crazy, dude. I like it!”. Its goes on. Was feeling pretty great on the decent until I got back to treeline. 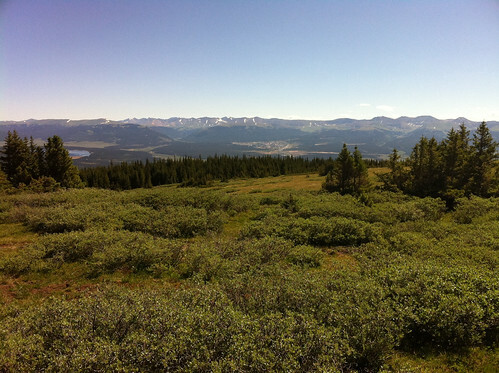 There is Leadville in the distance as seen from treeline. I started bonking a bit then. My shot blocks were hard and unchewable. Just grabbed a bad/old bag of them. Oops. Low on water too. Also started to get back the gut pain from last Sunday’s race. The downhill was bringing it back. So I just slowed up the pace and motored steadily back down the Colorado Trail to my car. Descent was about 1:15 given the relaxed pace. Nothing better than getting up high in Colorado! 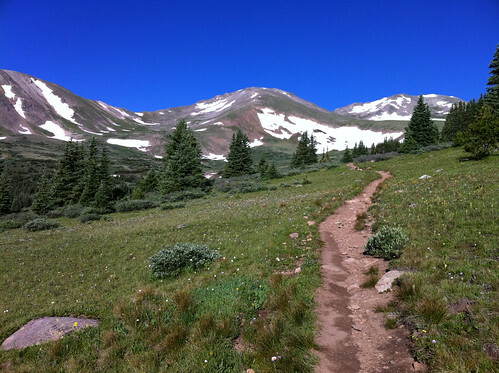 I went 13.28 miles with an elevation gain of 4,560 feet in 03:16:35, which is an average pace of 14:48. Heart rate average was 148. View my GPS data on Garmin Connect.